If you notice your gums are starting to pull away from the tooth surfaces, your teeth may become very sensitive and gum recession may be affecting the quality of your smile. Exposed roots can be troubling, as they increase the risk of root decay among other factors. Keep in mind that once the gums have worn away and you have exposed roots, they do not grow back. 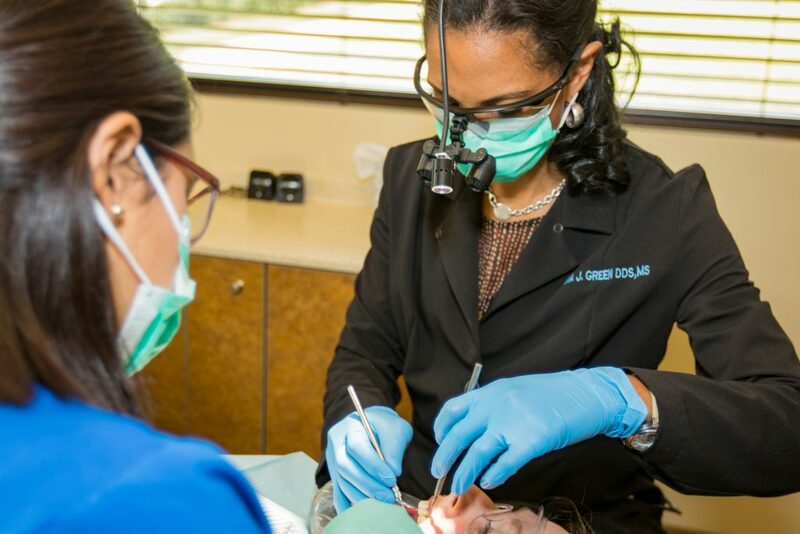 Dr. Green may recommend gum recession treatment, such as AlloDerm®, to restore your oral health. Gum disease. An active infection in the mouth, this condition destroys gum and bone tissue. Genetics. Some people are more likely to develop gum disease over time due to hereditary factors. Tooth brushing habits. Using the wrong brushing technique or brushing too hard can break down the gum tissue. Poor oral hygiene. Plaque buildup can increase your risk of developing gum disease, and therefore gum recession. Hormonal changes. Fluctuating hormone levels can negatively affect the gum tissues. Bruxism. If you have a habit of grinding and clenching the teeth, you may be inadvertently wearing down the gums. Crooked teeth. A misaligned bite can make the gums recede. Body piercings. Any type of body jewelry around the mouth can wear down the gums due to constant friction. "She's just really in a class of her own - from her knowledge, the technology that she's implemented to take care of the patient and perform it. And she'll make you feel like you are just so taken care of. " Gum recession treatment options include: soft tissue grafting, tissue regeneration, pocket depth reduction, and the Pinhole Surgical Technique (PST™). For more information about gum recession treatment options in Matthews, NC, schedule your appointment with Dr. Green today!